Our Abpromise guarantee covers the use of ab154806 in the following tested applications. 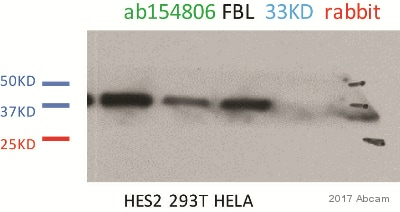 Immunofluorescence analysis of HepG2 cells labeling Fibrillarin with ab154806 at 1/250 dilution. Immunohistochemical analysis of paraffin-embedded Human colonic carcinoma tissue labeling Fibrillarin with ab154806 at 1/250 dilution. Immunohistochemical analysis of paraffin-embedded Human prostate tissue labeling Fibrillarin with ab154806 at 1/250 dilution. Immunohistochemical analysis of paraffin embedded Human thyroid gland carcinoma tissue using ab154806 showing +ve staining. Immunohistochemical analysis of paraffin embedded Human normal tonsil tissue using ab154806 showing +ve staining. Immunohistochemical analysis of paraffin embedded Human endometrial carcinoma tissue using ab154806 showing +ve staining. Immunohistochemical analysis of paraffin embedded Human breast carcinoma tissue using ab154806 showing +ve staining. ab154806 has not yet been referenced specifically in any publications. Publishing research using ab154806? Please let us know so that we can cite the reference in this datasheet.